Don’t have time to read this right now? Take this guide with you! First things first. Let’s define a few things: What is Dental Recall and why do I need a system for it? Dental Recall has many names as research has shown dental office staff tend to feel that recall has a negative connotation to it and want something more personal. Dental Recall synonyms include re-care, reactivation, continued care, etc…, but they all mean the same thing; getting dental patients back in the chair. In its simplest form, recall is to dental offices what marketing is to business. And since a dental office is at its root a small business, it only makes sense to think of recall activities as marketing. A dental recall system on the other hand, is an entire process of how you keep your patients coming back to you. While some define it as the actual software system, we define it as more off a process that includes software as a component of the larger strategy. A dental recall system is essentially the system or process a dental practice uses to schedule follow up appointments for continued care. 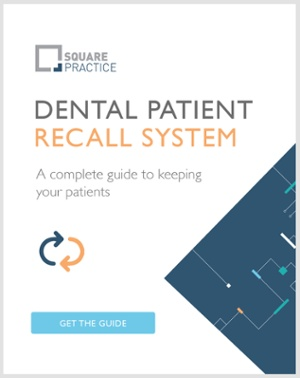 In this guide you’re going to learn tips to improve your dental patient recall system including what you need, why you need it, and how it will help grow your practice. What is our tone and voice we want to use when writing, calling or texting clients? What means of outreach do we want to use? Text? Email? Snail mail? Phone calls? How far in advance do we want to alert a patient of an upcoming routine cleaning? How about for a special appointment? What is our process for when the appointment ends and getting the patient rescheduled for their next appointment? Once you answer those 5 questions you will be well on your way to creating a recall strategy for your patients. You should type it out and create processes within your team to execute the strategy on a daily basis. This will take a bit of time upfront creating the strategy, processes and training staff on the recall system of your choosing, but in the end you will see an increase in ROI, patient satisfaction and great reviews online! Pro tip: Consider assigning one team member to oversee and be responsible for the recall process and ensure other employees are executing it properly so it doesn’t lose momentum after the first few weeks. The biggest bang for your buck in your recall strategy is pre-appointing. Every time a patient walks out the door without an appointment scheduled, that is literally money walking out the door that you may never see return. Pre-appointing helps close the backdoor of your company and sets you and your patients up for success. Don’t scare them off by offering too many procedures. Start with what’s next or necessary. Schedule a follow up call 5 months out for their next 6 month routine cleaning if they did not schedule it. It’s no secret that most dental practices are behind the times when it comes to software, automation and online tools. However, that is quickly changing with multiple systems coming online to help dental practices see the ease and benefits of going digital. While you may still be using paper, pencil and sticky notes to keep track of things, you’re most likely looking for a better way to hold people accountable to make sure patients are coming back to your practice. In all honesty though, who wants to wade through a sea of sticky notes, illegible writing and piles of paperwork when an online system could organize it all for you and give you a timeline for who to contact and when? It’s time for you to work smarter, not harder. The best part is, is if your recall system is electronic, you can hook up a KPI platform to your software and see exactly how much money walked out the door each day and how much you’ve won back! Talk about ROI! What if you knew that you could improve your bottom line by $200k just by reappointing existing patients? Wouldn’t you want a system that could tell you that? Now you can implement your dental recall strategy with your marketing mix of digital and printed materials to help bring back those patients. As they come in, the system tracks each dollar that you’ve won back. Talk about a way to motivate your front desk team. You can set goals, offer rewards and track the progress of your dental office staff. There are multiple communication systems you can use to easily keep in touch with your dental patients. One way is to take your recall system online and digital. From texting appointment reminders, to patients being able to schedule appointments online right from their phones, there’s no limit to what you can do these days. You have to find a system that works for you. Remember our marketing questions we asked ourselves earlier? Revisit that and decide how you want to communicate with your patients and find a system that works with what your office is able to do. Pro Tip: Going electronic for patient communication saves hours upon hours of staff time in the long run. Don’t be afraid of new technology. Embrace it and soon your team and your patients will be so glad you did! A dental KPI Dashboard can help you understand what is happening in your practice by numbers. They bring in the information from your practice management system and organize it in a way that gives you easy to understand data to create actionable steps from. You may be used to manually generated reports that you have to print out or reorganize on an excel spreadsheet. That wastes office managers and doctors’ time when you could have a system deliver the information you need right to you. Square Practice does just that. Our Reactivation Dashboard not only shows you broken and unscheduled appointments for patients who just walked out of your practice, it shows you the value of those patients over time and how much of that you’ve won back. The Reactivation Dashboard makes it easy to see how you and your staff are doing at reactivation your patient base. The numbers tell you if your recall strategy is working or if it needs some fresh ideas. If your recall strategy doesn’t include a KPI Dashboard system, you may not be aware of just how much that person who broke their appointment or who walked out without scheduling an appointment was worth to your practice. ROI is easy to measure as you win back each patient and your reactivated value rises. You need a well thought out dental recall system in place that includes a recall strategy, processes and automated systems. Having automation takes the heavy lifting out of your day-to-day recall activities and gives you back hours in your day to focus on the patients who are currently sitting in your practice. The automated systems can text, call, and email patients to get them back in the door while your KPI Platform shows you the success of your recall process on a daily basis. In this day and age there is no need to waste time printing reports that are outdated the moment you hit the print button. It’s time to take your practice online, stay relevant and reach your clients where they are. Did you enjoy this guide? Take it with you! Try the Square Practice Platform for a month for FREE when you sign up for the Square Practice Daily email! That's a $495 value! For just $1/day, you can get a daily summary of your practice's performance numbers sent right to your inbox!